Medical, popular, and literary understanding about the imagination converged when Thomas Willis asserted that he had discovered the area of the brain that facilitated imagining. 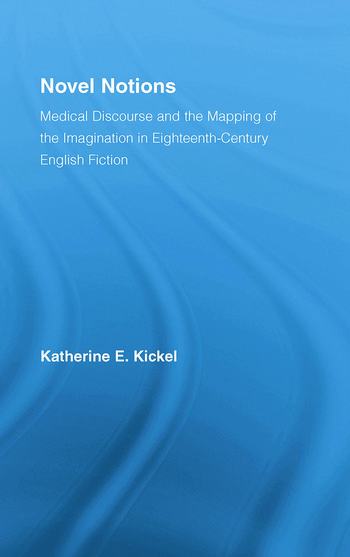 Taking this 'discovery' as paradigmatic, Novel Notions examines the reverberations of the medical investigation of the imagination in early British novels by Daniel Defoe, Henry Fielding, Laurence Sterne, and Ann Radcliffe. It argues that one of the novel's central features was a mapping of the terrain of human cognition, imagination, and creation, as a continuation of early modern medicine's account of perceptual experience. All the novels discussed reveal a simultaneous anxiety and excitement about medicine's understanding of the relationship between the imagination and perceptual experience through narrators who reflect on the nature of authoring.